May Day demonstration in Denver, Colorado. 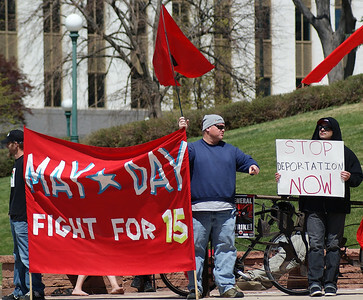 Protester waving red flags , occupy banners, and signs on minimum wage increase. 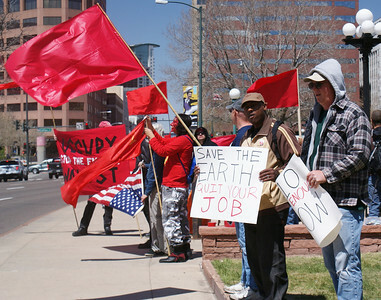 May Day protesters with red banners and upside down American flag. 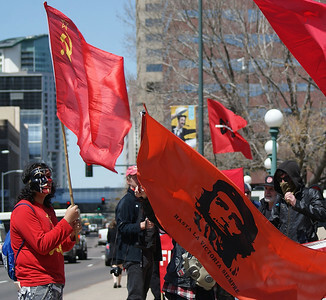 May Day protesters waving red flags and banners on city sidewalk. 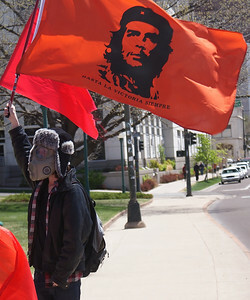 Group of May Day protesters waving red flags and holding banners, including Che Guevara flag and minimum wage banner. Two men hold red banner about $15 minimum wage, another man next to them holds "stop deportations" sign. 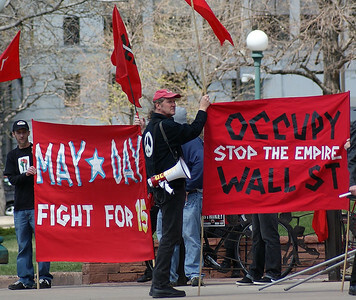 Man with megaphone holds occupy wall street banner, other demonstrators next to him hold May Day banner. 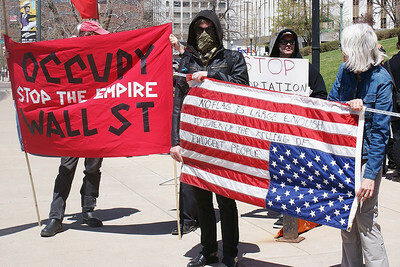 Demonstrators with Occupy Wall Street banner and upside down American flag, one wearing hoodie with bandana over face. 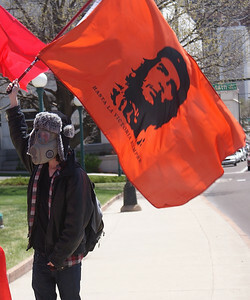 Man wearing gas mask waving flag with picture of Che Guevara on it. 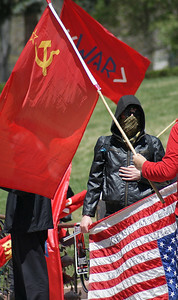 Man wearing red and black anonymous mask waving red flag with hammer and sickle on it, another man next to him waves red flag with picture of Che Guevara on it. 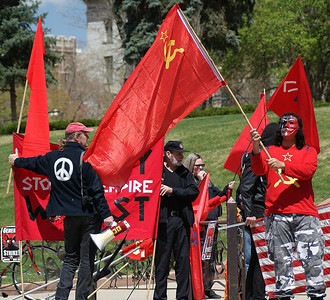 Man wearing red and black anonymous mask waving red flag with hammer and sickle on it, man with peace sign on back of coat next to him. 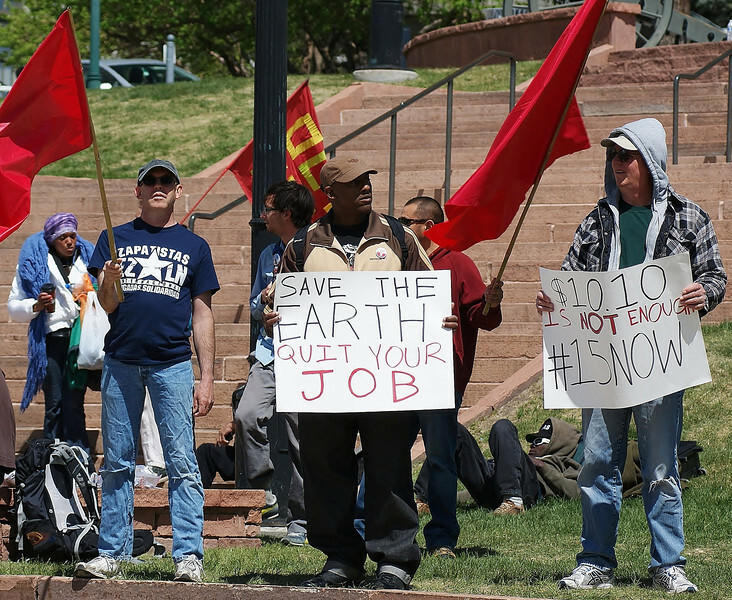 Demonstrators with red flags and banners, one sign about raising minimum wage another says "save the earth, quit your job. 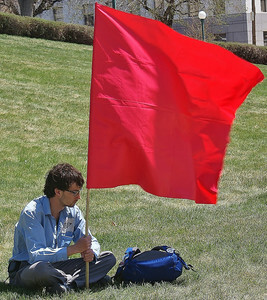 Youn man sitting on lawn, holding large red flag. 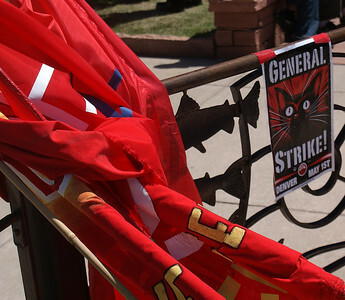 Furled red flags leaning on iron fence, general strike sign next to them.